Lit. large bottle strut. 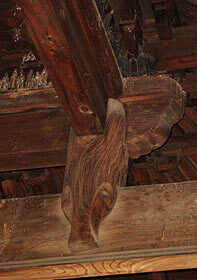 A strut that is used mainly in Zen style architecture *zenshuuyou 禅宗様. It has a circular bulge at its center or a bulge at the top that tapers to the base like a type of vase. The bottom of the strut is cut out to fit over a rainbow beam. Together these two members are called *kouryou taiheizuka 虹梁大瓶束. 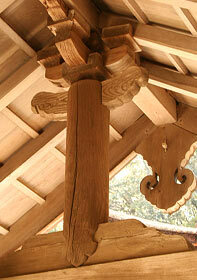 A bearing block *masu 斗, is mounted on the top to carry a bracket arm *hijiki 肘木. This combined member supports the weight of the structural elements above it. 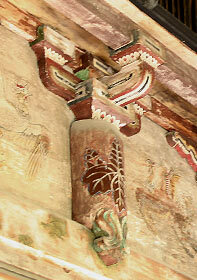 Because the lower part of the strut straddles a beam, its extended ends on each side are embellished with carvings of clouds wave patterns, or young leaves called oigata 笈形. 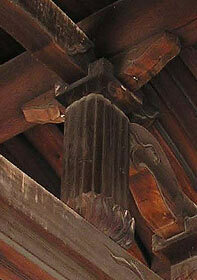 The bottom parts of the taiheizuka that hang down over the rainbow beam have ornamental carvings too. They are called *yuiwata 結綿.